When the basic kickwaxing is made with harder blue wax coated with soft and fast gripping 30G. You get fast kickwaxing with a solid grip. The hard layers of blue prevent snow crystals from penetrating too deep in to the wax and thin layer of 30G gives you the solid kick needed. The idea is similar to zero degrees -waxing. 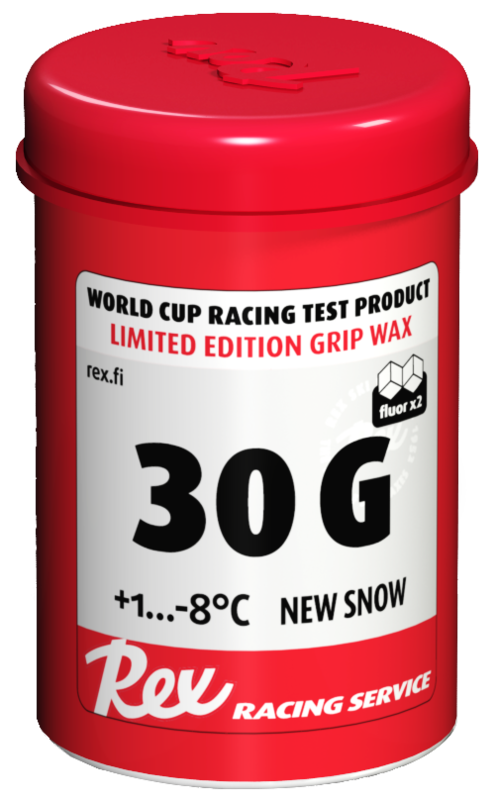 Hard base prevents the snow chrystals from penetrating the wax and relatively soft coating of 30G gives you the grip needed. Mix 30G grip wax with Universal Klister. This can be done by crayoning the 30g on top of Universal klister and then mixing them together with thumb. This is a basic waxing where kick wax is mixed with klister and it can be done also with different klisters. The idea is to mix some harder kickwax with soft klister to prevent icing of possible new snow and loose snow from the track.